If you want to take your company to the next level, you’ve got to go online. If you want to take that a step further, you can actually tap into the potential of your service and transform it into an application to make your clients’ lives easier. However, if you’ve got no app design or programming experience, getting yourself a good application might just remain a dream. And if you do make use of website builders or a web design company to help you, it may not be the easiest thing to tell them exactly what you’re looking for. So how exactly should you build a great application? What exactly should you be aware of, and what should you share with your design company? It may help to understand just why people clamor to have a great app in the first place, before actually proceeding with some essentials. For instance, did you know that it’s estimated that there were as many as 253.91 billion app downloads in 2017, which is a huge jump from 167.05 billion app downloads in 2015. Among the most popular in these applications, most were for social networking, downloaded by majorly young people aged 18 to 24. In fact, this demographic spends 90.6 hours almost every month in just smartphone applications, given it’s also the most popular medium for applications today. These numbers alone make the prospect of developing an application quite intriguing, especially when you think about the market you can potentially tap. Application Essentials: What Should You Always Remember? Get your basics right before everything else: While there are a lot of design tips and “tricks” out there, nothing beats the golden standard of actually getting your basics right. Before the insights and the data get followed through, your app won’t be able to do much if you don’t check with the basics first and foremost. Get these ones right before proceeding with anything else. Make sure navigation and placement are direct and simple for consumers. Assess which modules need to be upfront or hidden. Use proper elements and signifiers for navigation, and make them simple and consistent. Make sure you optimize your application for various screen sizes, especially across various kinds of OS. Try to make sure UI elements are consistent throughout your designs. You can start with small screens first. Make sure you give active feedback to your users. Let them know what’s currently happening at any given point in time. These micro-interactions help keep your users informed and keep your app fun. Make sure you don’t go overboard with your animation. Engage your users with animations, but remember they delay loading speed. Make your animations appealing, quick, and subtle so every second counts. Get one task for one screen only, given space demand: Remember that devices have limited space to work with, and this is much more the case in terms of smartphones. When you make your application, always remember this caveat so that you can maximize opportunities given to you. Imagine the kind of stress you’ll have just thinking about how to communicate information to your audiences with competing tasks. Not to mention, having multiple actions at once can be an extreme buzzkill. Make sure every important screen is focused on just one type of interaction for users. This at least helps users adapt easily to designs, and you can give more real value to your users. Make sure you do your best to simplify the entirety of your processes by just making users focus on one call to action at any given point in time. 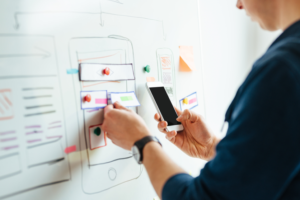 Remember the Rule of Thumb with your apps: When you design apps, always remember that the typical smartphone user can operate with one or two fingers – and these are both thumbs. A highly-distracted environment will cause a lot of users to engage with apps in just short spurts of visual attention, which means a lot of people do rely on their thumbs to get the job done. Make sure you check if users can actually perform a certain number of tasks in your app with just one hand under a minute. Make sure to design the flow of your application based on the “thumb zone.” This means negative elements or processes that can potentially harm the experience but are necessary (e.g., exit) are on the red zones or hard to reach areas so users don’t tap on them accidentally. The same also goes for the opposite – place frequently-used controls in easy-to-reach areas. Get to use your signifiers and affordances with care: Affordances are extremely important in making sure apps are easy to use and intuitive. Affordances can help you understand just how technology and the human mind interacts. Meanwhile signifiers are there to hint that a certain affordance is there. Understand how the two interplay so that your app becomes more consistent. Make sure you understand the different types of affordances. Visual affordances hint towards things users can do visually without needing any texts, such as raised buttons. Language affordances have clues such as “Go back.” Navigational affordances include menus and bars, while symbolic affordance hint towards symbols of commonly-used things such as email. 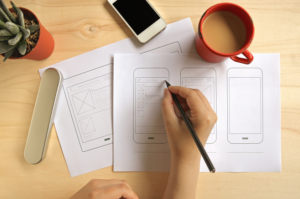 Consider that user interface matters a lot with design: When you design an application, make sure to remember that user interface is everything. Huge chunks of data playing with very limited space can be a buzzkill if you don’t know what you’re dealing with. Make sure there’s clarify and consistency with the UI. Designs should be there to help users do their tasks quickly and easily. Not only that, but make sure users associate aspects of yourapp with patterns to meet their needs immediately. Make sure there’s breathing space and familiarity. This means you should utilize familiar things to help users feel comfortable with your application, and breathing space such as white space and contrast is essential to make sure elements draw the users’ attention. With the above taken into account, it’s important to remember that building a great application isn’t always about how to make the most profit in the shortest amount of time. It’s important to consider that you can only really attain success with a service if people use it, and the case is the same with your app. If your application turns out to be burdensome to clients, no one would ever use it. Always keep this, and the above, in mind when it comes to creating a great application to come along with your business.